Chamber, a word that suggests enclosure, has an expansive field of meanings: cloud chambers, brooding chambers, chamber pots, chamber music, bullet chambers, dark chambers, chambres claires. Christopher Hanlon's chamber presents us with rubber plants, heads of hair, poly–satin and velvet pile. His motifs are interior, accumulated, and mute except for their quiet introverted chatter once our backs are turned. These paintings confront us with their posterior challenging us to find the right words to describe them. An empty podium dressed in fabric. A velveteen oxblood rondel that offers no point of entry. It hovers slightly above the floor, incorporating in its wefts (or woofs) and warps decades of dust and follicles. A rubber plant. Rubber plants yield a milky white latex, irritant to the eyes and fatal if taken internally. A rubber plant is tough love. The back of a shiny marble head with a strand of hair twirled into place by whom exactly? The anatomical word for the back of the head is occiput. The hair that curls into a shell–like cone at the occiput of Hanlon's painting's sculpted head has no follicles, no cuticles, no medulla. It has never grown. It has the smooth sheen of stone sculpted into seamlessness, but it exists in the semantic gap between being (or meaning) stone, hair, or pigment. Domo Baal presents Christopher Hanlon's third solo show in the gallery. There will be 8 new paintings (approximately). 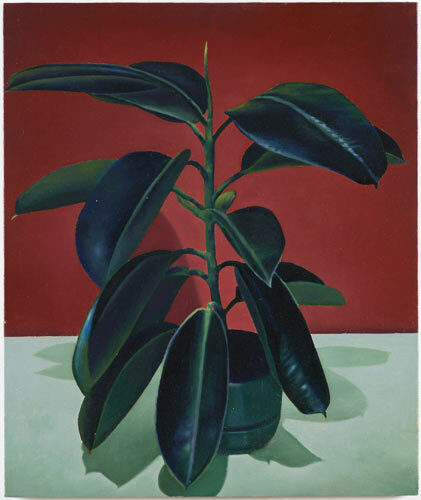 Domo Baal and Christopher Hanlon would like to thank Eva Wilson for this text, which she might well expand on as time goes by and the rubber plant makes new spring shoots – and the paintings make their way to the gallery. 'Oh, shoot!' thought the rubber plant as it sensed itself growing a new extension. It was a shot in the dark, this new leaf, still wrapped in its bright red protective sheath that would soon fall off like a shoe dropped nonchalantly to the floor after dangling on the tip of its owner's toes. The discarded skin would be released to drift down into the smooth terrene of laminate and screed once the leaf itself was mature. Inside the new leaf, another immature one was waiting to push into its own coating, at the meristemic cell of the Ficus. The immature leaf eminently appreciated the salacious roots of the rubber plant's Latin name as well as its modern variations – fare la fica, as in flipping the bird. This morning the postman handed me a jiffy bag containing the 1952 edition of André Malraux's Musée imaginaire de la sculpture mondiale. The 703 images of stone figures in Malraux's compendium are arranged to illustrate a 'confrontation of metamorphoses' letting another medium, the enigmatic, fragmenting, composed, dramatic act of photography, do the talking. Image number 635 shows a black and white photograph of the helmet fastened to the back of the head of Benvenuto Cellini's bronze sculpture of Perseus (1533) from the Loggia dei Lanzi in Florence. The helmet (functioning as a Janus head facing backwards) has eyes, wings, a dramatic nose leading to a radial moustache that blends into Perseus' curly hair at the nape of his neck. Perseus, as seen from the front, holds high the severed head of Medusa, the Gorgon, and shares with her a melancholy (and finally harmless) downcast gaze. Only the eyes on the back of his head stare straight out under flinty eyebrows. The eyes: slightly anxious, tired, like an old man's whose one–time ferocity is slowly fading into the growing disquiet of age. Malraux's hazy photograph tampers with the sculpture's bronze sheen and renders it instead rough and textured like a concrete cast that has stood in the rain. Christopher Hanlon's imposing painting of the back of another sculpted head (which however denies what even the flipside of Malraux's portrait possesses: eyes) uses the oil paint's glistening reflections to the opposite effect. The surface of the head is reminiscent of the sensation of fever dreams, when flashing neurons make you run your fingers endlessly over hallucinated, impossibly smooth, infinite surfaces. The same fever dream also seems to have come up with the disconcertingly small horns that appear to be growing out of the sculpture's forehead and that make not knowing this head's gaze even more unsettling. Hanlon seems to have a similar approach to the idea of an imaginary museum of images as Malraux, plucking them from a subliminal maelstrom of revenant motifs and juxtaposing them as fleeting aperçus, déjà–vu. But Hanlon disrupts what in Malraux's endeavour functions as a unifying codex of images by essentially severing them from their origins (much like Perseus' Gorgon head), from their compatibility with a history of similar tropes, from their conjugation within a pictorial grammar. In all their painterly virtuosity they remind me of someone who is relearning a language after a stroke or a trauma and fumbles to recognize and pronounce each word – words that are sometimes hairy, sometimes bulky like pebble stones. Rubber plant. Penumbra.